Is your skin dried out and tired after a long harsh winter? Is it looking a little bit sallow and in need of some serious TLC? Not to worry – Soy of Life has some great products that will tone, refresh, smooth and tighten your skin just in time for all of the spring activities on your calendar, from graduations to weddings to baby showers! Our Defying Time Serum is a powerful blend of active ingredients that visibly smooth fine lines and wrinkles from even the most stubborn parts of your face, leaving you with firmer and tighter looking skin. One ingredient, a unique olive extract, will make your skin look brilliant, young and refreshed. 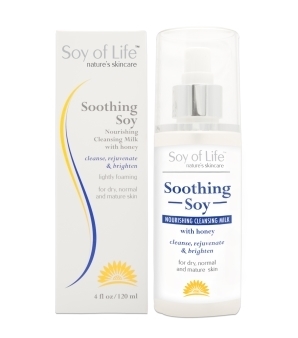 A nourishing cleansing milk that is chock full of honey, vitamins and minerals, our Soothing Soy product will leave your skin looking hydrated, soft and smooth. It can also gently remove oils and makeup without stripping your skin of its natural oils. Our About Face Toner & Spritzer is the perfect facial pick-me-up. It’s loaded with ingredients that will enhance your skin’s color, texture, elasticity, tone and smoothness, while also working to combat the signs of aging. Use this newest addition to our skincare line with our other cleansers and toners for an out-of-this-world seasonal skin transformation. Grace Your Face is a renewing two-in-one cleanser and toner, and works to renew, refresh and revive all skin types, whether your skin is oily, dry or a combination of the two. The unique botanical complex tightens pores while invigorating and refreshing your skin, and will also work to balance your skin’s pH level. Key ingredients include witch hazel, aloe vera, vitamins, chamomile extracts, essential oils and more. Soy Young! is the ultimate under-eye treatment, which is specifically formulated to combat wrinkles and fine lines. If you suffer from puffiness or dark circles under your eyes, you have to try this product. Its soybean oil, beeswax, sunflower oil and other natural organic ingredients will nourish the delicate skin under your eyes, making you look as young as you feel – or even younger! Remember, all of our products are formulated with all-natural ingredients, and bring your skin the transformative power of soy. Shop our full selection of products online now or call us today at 877-SOY-FOR-U.